Nothing is as perfect, iconic, and delicious as a beautifully-browned roast chicken surrounded by a puddle of buttery, garlicky pan juices. And if you’ve ever been hesitant to roast a whole bird at home, this one’s for you—it’s converted many a nervous meat cooker. 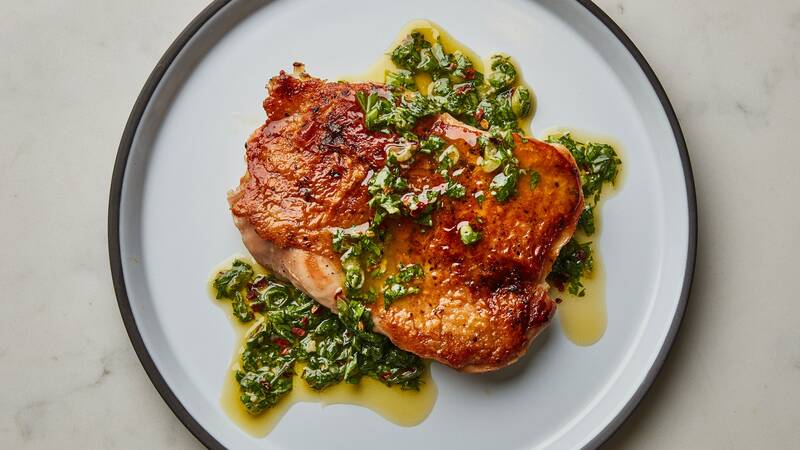 Consider this chicken, a hunk of good baguette, and a simple green salad your Sunday afternoon plan from now on. Set aside 1 Tbsp. cream. Add remaining cream, reserved chicken, 10 oz. peas, and 1½ tsp. salt and bring to a simmer. Taste and adjust for seasoning. Cook, tossing occasionally, until warmed through, 3–4 minutes. Transfer skillet to a rimmed baking sheet, which will prevent any juices that bubble out of the pan from spilling onto your oven floor. Like Coco Chanel removing one element of her outfit before stepping outside, sometimes you need to simplify a recipe before sending it into the world. When you’re developing, it’s easy to keep adding ingredients, but it’s much harder to take away. This braised chicken legs recipe gets rid of as many ingredients and techniques as possible without compromising on flavor. The secret to the simplicity lies in one crucial variable: Time spent in the oven. An hour plus in the oven might sound like a long time for a weeknight but hear me out. Chicken legs are full of fat and connective tissue and benefit from long, slow cooking. In fact, I much prefer the braisey, shreddy texture they get when slowly cooked in liquid to the bouncy, cooked-but-still-not-fully-tender texture they have when part of a whole roasted chicken, where the cook time has to account for the danger of overcooking the breasts. So I took away as many barriers as I could and got this dish into the oven as quickly possible. There is no searing or chopping. You frankly barely need a knife. The key is to just combine the coconut milk and curry paste (Maesri is our favorite brand) before adding the lemongrass (which is totally optional by the way), ginger (less optional), garlic (not optional). Then lay the seasoned chicken legs in the pan, turning them to coat them in the coconut milk, and get them in the oven. As they roast, the luscious creaminess of the coconut milk and the chicken’s richness combine and reduce to create a dense, flavorful sauce that begs for rice or bread. Don’t be concerned if the coconut milk breaks and starts to look a bit oily; that may happen depending on the brand of milk you use, and honestly there is nothing more delicious in the world so well done, you. Aside from spooning some of the juices over the chicken a couple times during baking, you’re free to go about your life while the chicken bakes. You will know it’s done when the leg joint flexes somewhat easily and the skin is nicely browned. Top it with cilantro, maybe a squeeze of lime and some toasted coconut chips (have you tried Dang brand coconut chips? They have earned that name IMHO). The best thing about this dish is that it tastes way more complicated than it actually is. If you don’t have an ingredient or forgot to add something don’t worry, Coco would be proud. No searing, no chopping, one baking dish. And if you don’t have ginger, garlic, and lemongrass on hand, a combination of any two will be plenty to make this chicken over-the-top delicious in about an hour. You can find curry paste in the Asian aisle at most grocery stores or at an Asian market; we recommend any from Maesri. Place a rack in top third of oven; preheat to 400°. Stir coconut milk and curry paste in a 2-qt. baking dish to combine (or, use a medium skillet if that’s what you’ve got). Add lemongrass, ginger, and garlic. Season chicken with salt (hold back a bit since curry pastes often have a lot of salt). Place in baking dish and spoon some liquid over. Bake, occasionally spooning liquid over, until chicken is browned, tender, and cooked throughout (the joint should be reasonably easy to flex), 60–75 minutes. This is a Public Service Announcement: If you aren’t making stock out of that leftover roasted chicken carcass, you are throwing money in the trash! According to Title 18, Chapter 17 of the U.S. Code it is illegal to dispose of money. STOP BREAKING THE LAW, PEOPLE!!! In my household, roasting a chicken has become a non-negotiable twofer operation. The chicken gets roasted until golden brown and delish (duh), and then that roast-y, toasty carcass gets turned into stock. There’s simply no question about it. Good quality chicken stock does not come cheap these days, and I for one, am not in a position to throw away free food. A quart of chicken stock from my local butcher (granted I live in NYC which is a ridiculously overpriced place to live), retails for $9. That’s about half the cost of an entire chicken! I’ve always held the belief that free food tastes more delicious. Think about it: when a waiter drops a dish on your table and declares it complementary, you are already predisposed to liking it a whole hell of a lot more than you would if you knew you had to pay for it. So think of your roast chicken as a two-for-one deal. Buy a chicken, and get two free quarts of made-from-scratch chicken stock. Thats a value of nearly $18. Did I chose the wrong career path?? I’m starting to think I’d make a pretty sweet salesperson. Now that we’ve sorted out the financial bit, here’s all you need to know about making it. Once the bird has been roasted and carved, I try to break the chicken carcass into a few pieces with my hands and huck it straight into a large pot, cover it just barely with water, bring it up to a boil, and then drop it to a gentle simmer. This takes a total of five minutes, which you can surely carve out of your day. If you have any aromatics laying around (think onions, shallots, carrots, parsley stems, garlic, ginger, a dried chile, mushrooms), you’ll only benefit from throwing those in the pot as well. No need to practice your fancy knife skills here, just halve ‘em and get em in there on the quick. Don’t have any aromatics laying around? GREAT. You’re still on your way to free AF liquid gold. Here’s the most important part about this very awesome two-for-one deal I’ve just walked you through. You gotta get that stock on the burner before sitting down for dinner. If you start in on your meal, you risk getting lazy, entering food coma and deciding you’ll start the stock later. A rookie move (yes, of course I’ve done it). Full flavored stock takes a couple of good hours of simmering to truly develop flavor, so the sooner you get it going the better. That way, you aren’t simmering into the wee hours of the night. Season with plenty of salt and taste as you go—the stock is done when it tastes delicious, you make the call. Strain it through a mesh strainer and discard all the bits and pieces; they’ve given all the flavor they have to give to the liquid. Let it cool and then refrigerate until you’re ready to use it, freeze it, or just drink it as-is. This chicken stock isn’t going to be as crazy and flavor-packed as the kind you make with pounds of fresh chicken you bought specifically for this purpose, but it will still be an incredible base for a quick soup the next day, a speedy risotto, or a casual braise. And that’s money, kids. Let’s back up for a second—first, you gotta roast a chicken! You shouldn’t be serving turkey at your Friendsgiving. Before we get any further into this argument, I just want to admit that I am not even close to being a Turkey Guy. Besides a turkey club, I think it’s a food that possesses minimal worth. Yes, I am biased. But I also have the success of your Friendsgiving in mind, so hear me out. You should be roasting chicken at your Friendsgiving. Whether it’s one whole chicken or two, roasting chicken instead of turkey is going to make for a tastier, easier, more successful party. And yes, this is a party. Choosing chicken will help you out before we even step foot in the kitchen. Chickens, for the most part, are smaller than turkeys. I’m not sure if you knew that or not, but they are. You can look it up if you doubt my credibility on the subject. But I promise you that the whole chicken you buy at the grocery store or butcher shop will weigh less than a whole turkey. And that means it will be easier to carry, especially for someone like me. I don’t have a car. I live in a city. I walk and ride the subway. Which means there’s a zero percent chance that I will ever volunteer to carry a whole turkey anywhere. Do you want to be the person deciding whether or not it’s acceptable to rest your 16-pound turkey on the subway floor, four inches from someone’s gnarly running sneakers, because your arm is tired? No. You don’t. That’s a lose-lose scenario. Chickens get from point A to point B much more easily. Also: How many people are you feeding, anyway? Yeah: not enough people to necessitate roasting a 15-plus pound animal. It’s also worth noting that whether you’ve roasted a bird before or not, a chicken is always less stress than a turkey. Less expensive. Less of a commitment. Less intimidating. Easier to schlep, but also easier to handle mentally. But that difference in size also means that roasting a chicken (or a couple chickens) will take far less time than roasting the traditional, gargantuan, colonial-era poultry. You can roast a single chicken in about 45 minutes. Two will take a little longer, since there’s more heat being conducted, but the chicken will still be ready to serve much sooner than a turkey. As someone who went four years with a minuscule oven, I cherish the fact that chicken gives you more time and oven space to devote to side dishes. The mashed potatoes. The biscuits. The sweet potatoes. The salads. The sprouts. The stuff that most people like way more than the turkey. Speaking of turkey, when was the last time you went to a restaurant and ordered turkey that wasn’t on a sandwich? Oh. Not in the last year? Not in the last decade? Never? And when was the last time you ordered chicken? Last weekend? This week? Last night? Yeah, that’s because more people like chicken than they do turkey. Because chicken tastes better. But why does chicken taste better? Well, there are a couple reasons. First, the ratio of skin to meat on a chicken is better than that of a turkey. Since a chicken is smaller, there’s going to be more crispy, brown, beautiful skin for every bite of meat. Part of the reason turkey breast can be so bad is that there’s never enough skin to go around. Less meat, in this case, is more. A roast chicken can look nice too! The entirety of a chicken also cooks at the same rate. A turkey does not. The historical pitfall of the turkey is that the breast dries out in the time it takes the thighs to cook. And if you pull turkey out when the breast is perfect, the thighs will be undercooked. It’s a cruel paradox, and you can blame the massive size of the turkey for that. I’m not saying that it’s impossible to make a good turkey, but it takes some practice, and it’s just easier to roast a chicken so that all of it tastes amazing. And I don’t know about you, but I like to serve my friends food that tastes amazing. That’s called being a good friend. And if you follow the logic I’ve presented about chicken being better to turkey, that means the chicken leftovers will be better than the turkey leftovers. Chicken salad is better than turkey salad. Chicken stock is much easier to make, because you don’t have to use a 348-gallon pot. Chicken tacos are better than turkey tacos. Chicken soup is better than turkey soup, just as chicken fried rice is better than turkey fried rice. Your chicken choices will continue to pay off for days to come. But really, the reason you should serve chicken instead of turkey is that these are your friends. You don’t have to impress them. You don’t have to serve a massive, picturesque bird. They’ll love you either way. They chose to spend time with you on the day (or a day surrounding the day) that’s all about showing thanks for the things you value in your life. This is about showing your friends that you’re thankful, and the best way to do that is show them a good time. Friendsgiving is about celebrating in the way your family wouldn’t. Crack the sixth bottle of wine. Put miso in your green bean casserole. Turn up whatever playlist is ripping through the stereo. Eat those special brownies. Talk about politics. Roast a couple chickens. Tell your friends you love them. This is your Thanksgiving. It’s all groovy. Want an easy roast chicken recipe? Yeah, you do. So I got home and followed Basically’s no-fail roast chicken recipe, which calls for a 3-4 lb. chicken, a lemon, half a stick of butter, and a head of garlic. And kosher salt, duh. I unwrapped my Bell & Evans chicken (I was told this was the most ethical option to be had from my local crummy grocery store and bought it because I’M A GOOD PERSON) from its plasticky death condom and eww there was blood in there. My womanly fears of imminent chicken death set in and, after I tossed it, I washed my hands for the first of seven times. Say it with me now: YOU WILL CERTAINLY DIE OF SALMONELLA. (Editor’s Note: You will probably not.) Inside the chicken there was a bag of innards, which I pitched right in the trash, where my sense of self is. While chicken is cooking, place anchovy, garlic, and 1 tsp. salt in a mortar and use pestle to pound to a paste, about 1 minute. Add parsley and continue to pound until completely pulverized, about 2 minutes. (Alternately, grate garlic and finely chop anchovy and parsley, then mix together in a medium bowl.) Mix in oil, vinegar, mustard, and red pepper flakes with pestle, then add scallions. Taste and season with more salt, if needed.